Here is an Indian's costume headdress hat that you can make yourself. Buy some craft feathers or cut them from colored paper. Then cut a stiff paper strip, long enough to fit around your head. Cut notches at each end that fit into each other. Line up the feathers in a row on the inside and tape them down. Lets turn an old pair of tan khaki pantsinto real Indian pants. Have your Mom or Dad help you pin the pants down the sides to fit the legs more closely—make them just wide enough to get them on and off. Then seam (sew) the sides and cut away the extra material. For the fringe, use canvas or felt if you have it—otherwise any sturdy fabric will do. Cut two strips about 1 1/2 inches wide, and make them the length needed from the waist to the bottom of the pants on the outside. With a sharp scissors, cut the fringe about 1 inch in depth. This leaves a strip about 1/2 inch wide to attach to the outside edge of the trousers. See Figure a above. 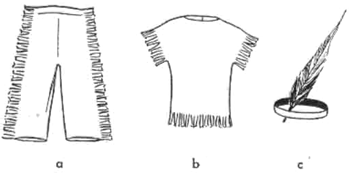 Improvise an indian shirt by using an old shirt or pajama top and cutting fringe along the bottom and around the arm holes the way that you did above. See Figure b. Finally, with a narrow band around the forehead and a feather tucked in back of it, the costume is complete. See Figure c.
DIY How to Make Your Own Indian or Native American Halloween Costume for Your Kids - Learn how to make a simple homemade Indian costume for your kids. How to Dress Like an Indian - This tutorial will show you to make both a Indian man and woman costume. How to Make a Native American Costume - Make a fascinating Native American costume from a t-shirt, potato stamp, scissors, fabric paint, and a few other materials. How to Make a Native American Headband - Learn how to make a realistic Native American headband by following these instructions. How to Make an Indian Child Costume? - Make an Indian Child Halloween costume from moccasins, brown dress or paint outfit, jewelry, feathers, tomahawk and a leather belt. 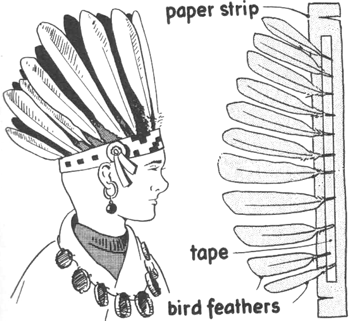 How to Make a Paper Head Dress for a Native American Costume - No Native American costume is complete without this headdress made from brown parcel wrapping paper. How to Make a Pocahontas Costume - Follow these instructions to create the perfect Pocahontas Halloween costume. How to Make Indian Costumes for Boys and Girls - This is a simple Indian costume children can make for Halloween. How to Make Indian Coup Stick for Halloween Costume - Complete your Indian costume by making this Indian coup stick. How to Make Native American Costumes for Kids - This video will show you how to make a Native American Halloween. How to Make Native American Headdresses for Kids - This video will show you how to make a headdress for your Native American costume. How to Make Old Indian Man Halloween Costume - Learn how to make an old Indian Man Halloween costume from old faded clothes. Make a Native American Cheif Hat (War Bonnet) - Find out how you can make a simple Native American Chief War Bonnet. Make Your Own American Indian Costumes - This website has everything you need to know about Native American costumes. Native American-style Costume for Babies - Make a simple Native American costume for your baby using a toddler size bathrobe, fleece, feathers, baby shoes and other supplies. No Sew" Native American Costume - Find out how to make a Native American costume that requires no sewing. Quick, Easy Last Minute Halloween Costumes for Kids: Native American-Indian Girl - This is a great last minute Native American costume for girls.